As I’ve mentioned before, I took a trip to Italy earlier this year and came away so inspired by all the different foods I ate while there. 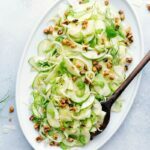 This apple and fennel walnut salad is a recreation of one of the most surprising things I ate in Italy. And surprising in a good way. In one of the cooking classes my husband and I attended, we watched as the instructor made a variation of this salad and the entire time I thought, I won’t love that one – mostly because I’m not a fan of fennel. But when it came time to eat I absolutely loved it! The flavors complement each other so well that even I enjoyed the fennel. I talked a lot about using authentic Italian products here. High-quality ingredients really make such a difference in your finished dish, and will take it from good to great. So how do you know if a product is an authentic Italian product? Simple! The label on the product will say “Made in Italy.” A lot of products are “Italian-sounding,” or “Italian-looking” but aren’t really made in Italy. By giving labels a quick check, you can be sure you’re getting the best authentic Italian ingredients! Make sure to emulsify the oil. To do this, I like to combine the lemon juice and Toscano PGI Extra Virgin Olive Oil in a mason jar and shake it until well combined. You can briskly whisk the two together, but I’ve found the mason jar works the best and fastest. Use a mandolin slicer. 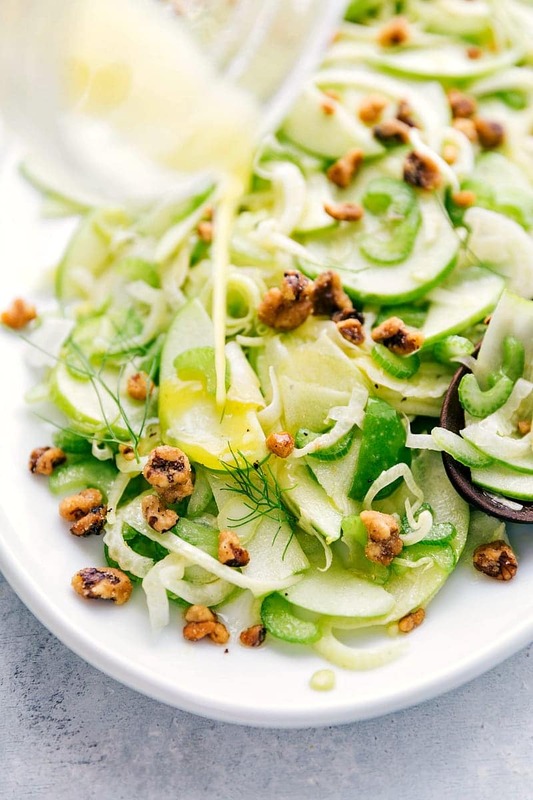 The fennel bulb, apples, and celery all get sliced very thin, which gives the salad a great texture. Using a mandolin slicer will ensure everything is uniformly and consistently cut. You want paper thin apple and fennel slices! Toast the walnuts. Toasting the walnuts adds so much flavor to this salad. Don’t believe me? Just try it and I’m sure you’ll become converted:) Sometimes I buy pre-toasted walnuts at my local grocery store if I’m pressed for time. 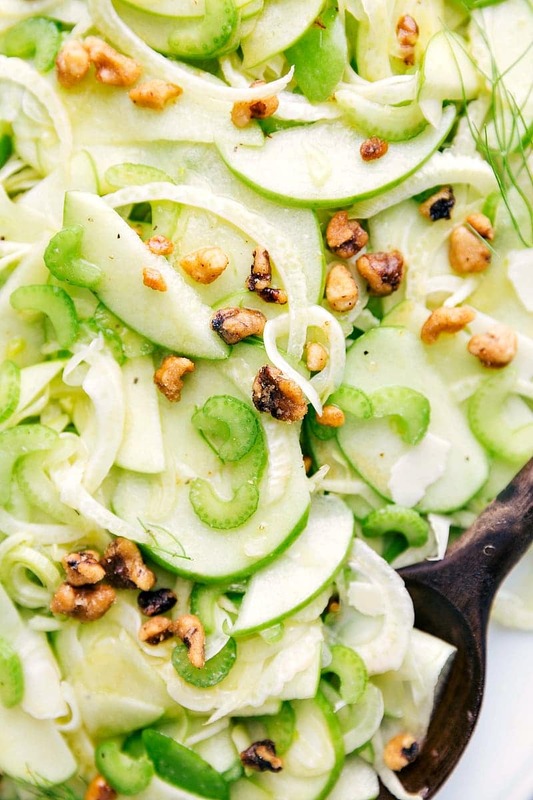 Can I make this Apple Fennel Salad ahead of time? This salad doesn’t sit well, so avoid making it too far in advance. The lemon juice in the dressing will delay the apple from browning, but I’d recommend not making this salad more than 30 minutes in advance. 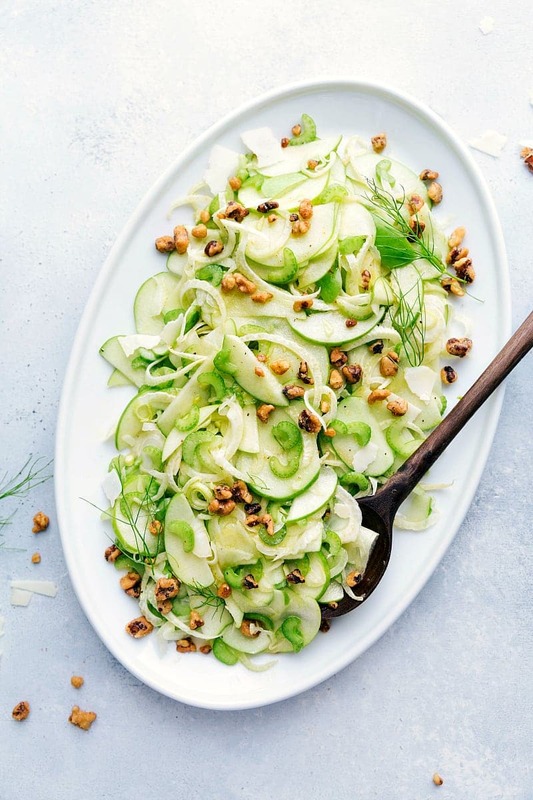 This salad tastes the very best with cold ingredients, so make sure to stick your fennel, apple, and celery in the fridge for a few hours before preparing the salad. You’ll also want to add the walnuts and Parmigiano Reggiano PDO RIGHT before serving to keep them from getting soggy. Enjoy! In a mason jar, add the freshly squeezed lemon juice and Toscano PGI Extra Virgin Olive Oil. Add salt and pepper to taste (I use 1/2 teaspoon salt and 1/4 teaspoon pepper). Put on the lid and shake to combine until dressing is emulsified. Add and taste to adjust salt/pepper/lemon as needed. (If your lemon isn't super ripe, you might want a bit more juice). Using a mandolin slicer, thinly slice the fennel bulb. Cut the apples in half and then half again. Remove the core and then thinly slice all the apples on the mandolin slicer. Thinly slice the celery on the mandolin. Add the fennel, apple, and celery to a large bowl. Gently toss the salad with the dressing. Right before serving add the roasted walnuts and freshly shaved/grated Parmigiano Reggiano PDO. Enjoy! I got to live in Italy for three years and it changed my life! I had a similar experience; not liking certain foods and then loving them after being prepared with an Italian appreciation and technique. You and I could probably talk for hours about Italy and their food. I still plan on returning to attend a culinary school there. And this recipe sounds amazing! Can’t wait to show it to my mom! Ahhh what an amazing experience! I am soooo jealous! I could seriously talk about my experience and food for hours too! And oh my gosh how cool would it be to attend culinary school there! AMAZING!!! But seriously you guys have to try this one! Where do you buy the Toscano PGI Extra Virgin Olive Oil? Hey Lisa! I got it at my local Kroger store (Smiths) near all the olive oils! I’m making this tonight but know there will be left overs. You said it doesn’t sit well. Any tips for keeping it well for lunch tomorrow? I’ll keep the nuts and cheese on the side but will the dressing keep it from browning? How mushy will it het? To be honest this is the first time I have read about apple salad and I am gonna try for sure.